Lockstep is a fantastic, entertaining novel that I find a bit difficult to summarize. The short version is that it will probably appeal to readers of young adult and hard scifi, but existing experience with scifi will definitely help ease the process. Schroeder is most interested in the way developments like cryogenic sleep and interstellar travel might change human society, and he dives deep into almost every aspect of the “lockstep society” he’s created for this novel. The story kicks off when seventeen-year-old Toby McGonigal goes on a fairly mundane mission to claim an asteroid for his family, who’ve settled on a far-off planet to escape Earth’s corruption. Something goes wrong with Toby’s ship while he is en route, and instead of staying in cryosleep for a short time, he wakes up to discover that a huge amount of time has passed and everything he knows has irrevocably changed. These changes are social, political and extremely personal, and the more we learn about the lockstep society, the more heart-breaking Toby’s story becomes. The first important thing that Toby learns is that humans colonized hundreds of far-flung worlds thanks to one of his family’s inventions. However, because faster-than-light travel doesn’t exist and most of the colonized worlds are short on natural resources, the only way for the colonies to survive and trade with each other is for every world to go into cryosleep for set periods of time at the same time. While everyone is in cryosleep, ships travel vast distances and limited resources build up enough to keep them alive. In the lockstep society founded by Toby’s family, this means thirty years of cryosleep for every month of time spent awake in real-time or “fast time”. This leads to Toby’s second discovery, which is that despite the fact that huge amounts of time have passed since he left on his ill-fated trip, some of his immediate family members are still alive. The problem is that they are now infinitely powerful, decades older than when he last saw them, and, much to his surprise, bent on killing him just for existing. It turns out that while Toby was gone, his family members not only cemented their control over a huge society of hundreds of worlds, but also built up an intricate mythology behind his disappearance. His reappearance in their world threatens their control, and he soon finds himself running from the man and woman he used to call his little brother and sister. One of the most fascinating aspects of Lockstep is the idea of human civilizations getting out of sync; inside the lockstep society, everything stays the same despite decades spent in cryosleep, while outside societies rise and fall in real-time. Humans slowly become post-human, intergalactic wars destroy entire worlds, and cities build up outside the gates of sleeping locksteps. A constant influx of settlers from outside worlds means that there are people born millennia after Toby now living inside the lockstep society, people who grew up their entire lives hearing about the legendary McGonigal family and their lockstep worlds. 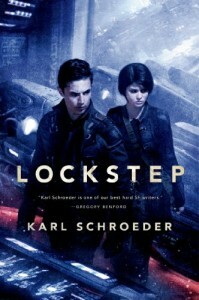 Lockstep definitely has the young protagonist common to the YA genre, and the lockstep world is ultimately a failed utopia, but the hard scifi elements might make it hard to sell as a YA novel, which is probably why it’s not marketed as such. However, I definitely think this book would appeal to YA readers if they’re willing to wrap their head around some fairly complex world-building. I might recommend it to someone who enjoys books like Scott Westerfeld’s Uglies series, but wants to read something that plays on a bit bigger canvas. Personally, I really enjoyed reading a book that explored theoretical worlds in such depth, and I highly recommend it. Also, the book definitely wraps up all of its threads at the end and feels like a very solid standalone, but I wouldn’t mind reading another story set in the same universe.